U.S. Senator Susan Collins speaks at the Penobscot Bay Regional Chamber of Commerce's Quarterly Business Breakfast in Rockport, Maine, on October 13, 2017. ROCKPORT, Maine — U.S. Sen. Susan Collins said Friday that she won’t run for governor in 2018, avoiding what may have been the fight of the moderate Republican’s political life against a primary base that looks to have grown more stridently conservative. The decision all but guarantees that her mark on Maine’s political history will be stamped in the Senate, where she’ll have served for 24 years at the end of this term in 2021 — as long as Margaret Chase Smith, her idol, and longer than William Cohen, her predecessor and mentor. Collins made her announcement after an address on health care and “hyper-partisanship” in Maine and Washington before a business group in Rockport, capping it by saying to a standing ovation that she will continue in the Senate and work to improve the economy, health care system and foreign relations. Public speculation about Collins running for governor has persisted for well over two years. She fueled it in recent months, publicly weighing her seniority in the Senate against her desire to work on economic development issues and saying her goal would be to “heal the state” — in what qualifies as a jab at Gov. Paul LePage from a senator preternaturally careful with words and actions. The Republican Party she’s in now is different from that of Collins, Smith and Cohen. 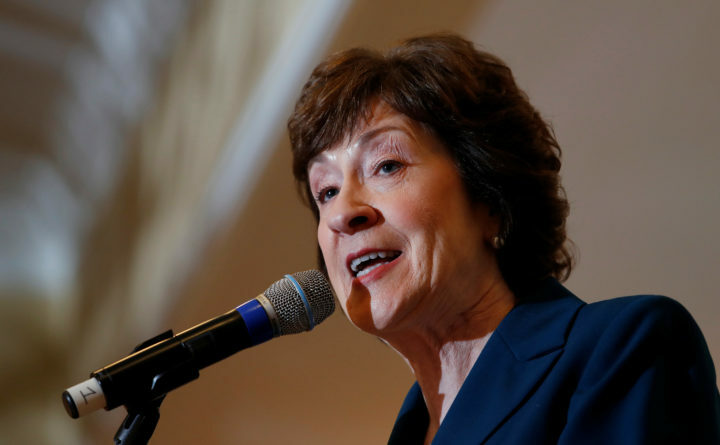 Collins supported Republican presidential candidates until coming out against Donald Trump last year. Her opposition has blocked two President Trump-backed bids to repeal the Affordable Care Act. Collins, 64, a Caribou native who lives in Bangor, is Maine’s most popular politician, regularly registering approval ratings in the high 60s, and has carved out a key niche in the Senate on the body’s health, intelligence and appropriations committees and as a swing vote. A gubernatorial run would have put a safe seat in jeopardy for Senate Republicans. But a Republican primary was going to be her problem in a gubernatorial run. That’s different than one would have thought in 2014, when LePage welcomed Collins to a food drive photo op just before the Election Day when he won his second term. She won her fourth. After Collins refused to support Trump, LePage said she was “done in Maine.” The governor then hammered her in July after her first vote against a Republican health care bill, telling supporters she’d “back down” from running for governor if they rejected her. Collins isn’t done, but her standing with hard-line Republicans may be damaged. A shadowy poll from a Democratic firm in August said 6 in 10 likely primary voters disapproved of her. Republicans told the Bangor Daily News she’d have a hard time in a primary, although an internal poll showing Collins leading was leaked to a BDN columnist this month. Running for governor would have been a risk, and it was treated with Collins-esque care. Some close to her said she seemed truly undecided until just before the announcement, but they put her chances of running around 40 percent. Collins said she made her decision only Wednesday. Now, the Republican field could grow: Former Maine Health and Human Services Commissioner Mary Mayhew of South China, House Minority Leader Ken Fredette of Newport and Senate Majority Leader Garrett Mason of Lisbon Falls are the only ones running.